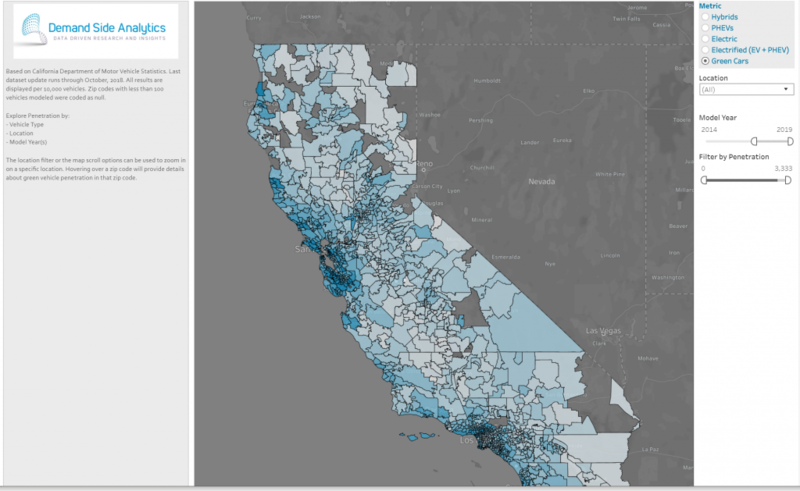 Earlier this week, the California Department of Motor Vehicles posted a granular data set with vehicle registration details by zip code, vehicle type (gas, electric, plug-in-electric, hybrid, etc), model year, and make (e.g., Tesla, Toyota, etc.). The data runs through October, 2018. Because it includes all vehicles, it provides insight into the penetration of electrified vehicles overall and by model year. We decided to visualize it, make it interactive, and share it. Enjoy. We’ll be visualizing vehicle penetration data from Massachusetts and New York relatively soon. If you know of other states that provide granular vehicle data, drop us a note and we’ll add them to our list.